Aaron Cresswell in an England shirt, finally. What a sight that was in midweek. Let’s hope he enjoys plenty more opportunities under Southgate. The match we’ve all been waiting for has arrived. We’re the late kick-off on Saturday as we travel to North London to face the team that paid £11m for Sergei Rebrov. Spurs home and away are instantly the two fixtures that we’re all looking for when the Premier League publish the schedule in June. We all know it won’t be an easy day, but winning makes the following Monday morning in the office feel like a Friday! Although they defeated us 4-1 at home last November, Tottenham have won just one of their last four games against us at White Hart Lane (D1 L2) in all competitions. We’re a massive 13/2 to grab all three points, which is well worth a dabble. Rumour has it the home side are struggling with injuries. Although, on paper, that should mean we’ve got a great chance, we’re West Ham. I don’t need to say any more about that. However, this is a derby and our players will be eager to claim bragging rights! Fancy a repeat of three years ago? 0-3 is a whopping 80/1 with Betway if you think lightning will strike twice. The better bet might well be on over 2.5 goals, available at 8/11 with our sponsors, as six of the last nine meetings have seen three goals or more scored. This is Spurs’ longest winless run in all competitions since May 2004, in which they went eight without a victory. Bearing this in mind, it might well pay to get on us in the draw no bet market at 15/4. Despite this stat, they are the only unbeaten Premier League side remaining this season and they won’t give that record up easily. They’ve also been boosted by the return of their talisman Harry Kane, who has scored three times in two previous home league games against us. He also has 15 goals in his last 15 London league derbies. I really do hope we keep him quiet but it would not surprise me if he manages to find the net. He’s 3/1 with Betway to score first, 3/4 anytime. 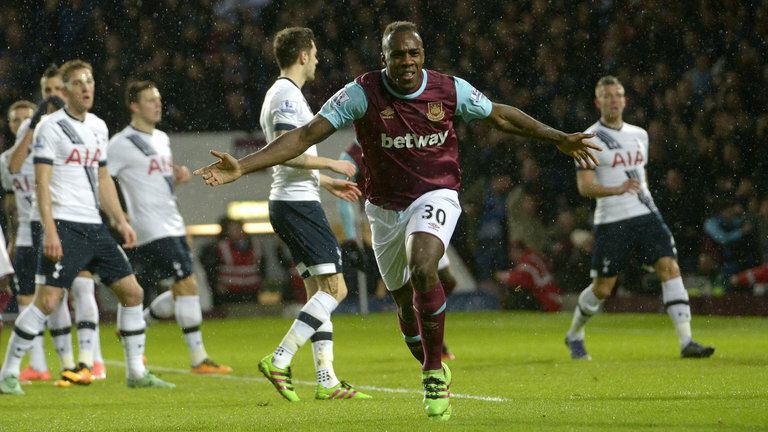 Michail Antonio scored again last time out (Glenn Whelan certainly doesn’t want to claim it!) and let’s not forget that he scored a headed winner when we last played Spurs. He’s available at 11/1 to score first, 7/2 anytime. Dimitri Payet has created 40 goalscoring chances this season in league competition, more than any other player in the big five European leagues in 2016-17, so we’re bound to have a few chances, we just need to be clinical. Other first goalscorer odds worth noting include Ayew at 10/1, Payet at 10/1 and Lanzini at 13/1. For everyone at the game and beginning their day in a Wetherspoons from 9am, enjoy! For those watching on TV, enjoy! Let’s do ‘em in their own backyard, again. Good luck with your bets. IIIIIRONS!